Situated near the airport, this hotel is within 2 mi (3 km) of K1 Speed, Young Israel of Hollywood Beach Synagogue, and Topeekeegee Yugnee Park. Club at Emerald Hills and The Casino at Dania Beach are also within 2 mi (3 km). Fort Lauderdale Airport Station is 27 minutes by foot and Hollywood Sheridan Street Station is 28 minutes. Situated in Dania Beach, this hotel is within a 15-minute walk of The Casino at Dania Beach and Gallery of Amazing Things. Hollywood Beach and Port Everglades are also within 6 mi (10 km). 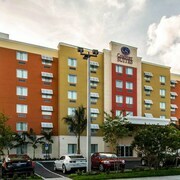 Situated in Dania Beach, this hotel is 0.6 mi (0.9 km) from The Casino at Dania Beach and within 3 mi (5 km) of K1 Speed and Sheridan Square Shopping Center. 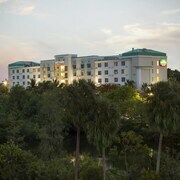 Hollywood Beach Golf Resort and Anne Kolb Nature Center are also within 3 mi (5 km). 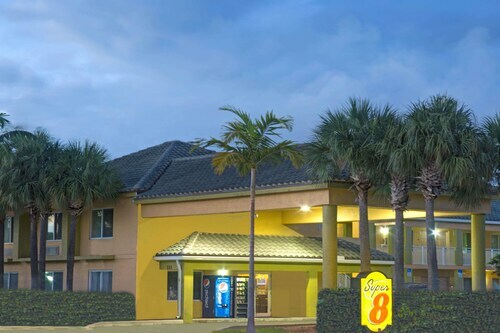 Situated in Dania Beach, this hotel is 0.8 mi (1.2 km) from The Casino at Dania Beach and within 3 mi (5 km) of K1 Speed and Sheridan Square Shopping Center. Hollywood Beach Golf Resort and Naval Air Station Fort Lauderdale Museum are also within 3 mi (5 km). 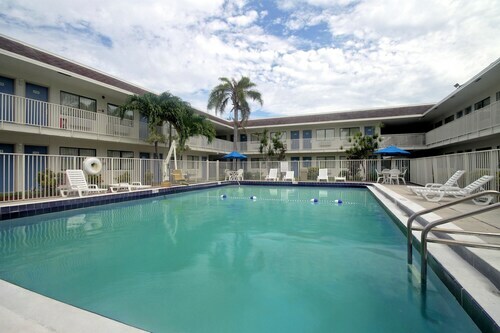 Situated by the sea, this motel is within 6 mi (10 km) of Hollywood Beach, Port Everglades, and Riverwalk. Las Olas Boulevard and Fort Lauderdale Beach are also within 9 mi (15 km). 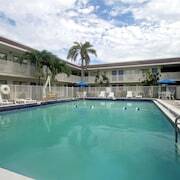 Situated near the airport, this motel is 0.9 mi (1.5 km) from The Casino at Dania Beach and 2.5 mi (4 km) from Hollywood North Beach Park. Sheridan Square Shopping Center and K1 Speed are also within 2 mi (3 km). 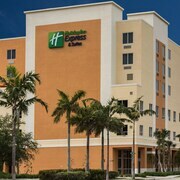 This South Florida hotel is 1 mile from Dania Beach and within 4 miles of the Fort Lauderdale airport and Port Everglades via the hotel shuttle. Miami International Airport is 20 miles away. Situated near the airport, this aparthotel is within 2 mi (3 km) of K1 Speed, The Casino at Dania Beach, and Young Israel of Hollywood Beach Synagogue. Topeekeegee Yugnee Park and Club at Emerald Hills are also within 2 mi (3 km). 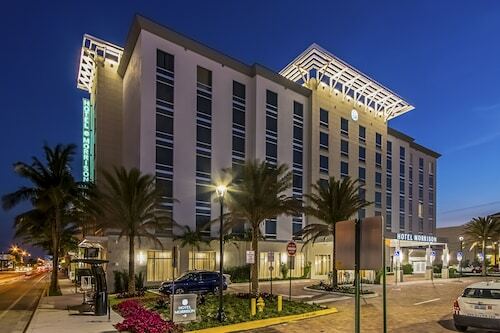 This modern hotel is 8 miles (12.9 km) from Fort Lauderdale-Hollywood International Airport and 4 miles (6.4 km) from Port Everglades. Highway I-95 is a 2-minute drive, and area beaches are 15 minutes away. A free shuttle service makes it easy to get to local shopping and dining hotspots. How Much is a Hotel Room in Dania Beach? 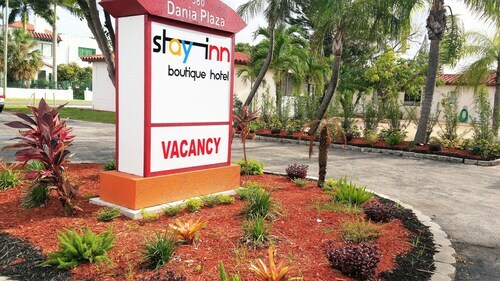 Hotels in Dania Beach start at $59 per night. Prices and availability subject to change. Additional terms may apply. If you're searching for comfortable places to stay in Dania Beach, you will have no shortage of choices. Travelocity's comprehensive database features 180 accommodation options within a 6-mile (10-kilometer) radius of Dania Beach's heart. 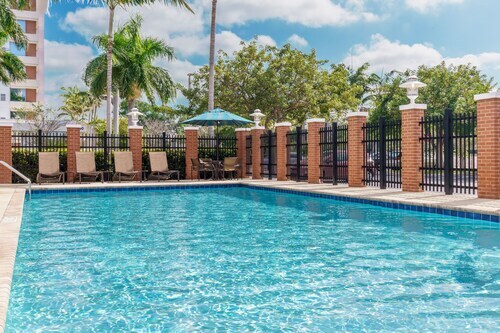 Dania Beach offers visitors some handy places to stay, including the Holiday Inn Express & Suites Fort Lauderdale Airport South and Super 8 Fort Lauderdale Airport. Families, students and those keeping an eye on their dollars can choose from nice Dania Beach accommodation options that won't that won't make the bank manager's jaw drop. 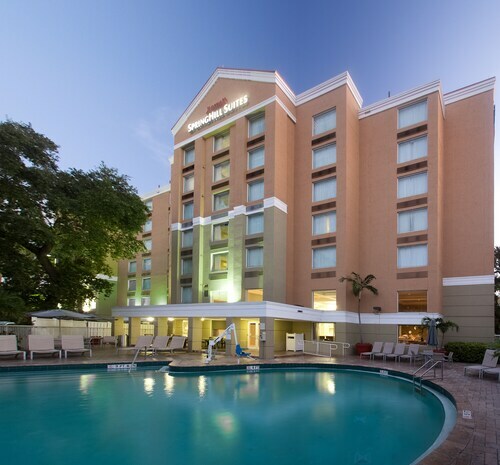 The Cambria hotel & suites Ft. Lauderdale Airport South & Cruise is 1 mile (2 kilometers) from downtown, while the Best Western Plus Fort Lauderdale Airport South Inn & Suites is 1 mile (2 kilometers) away. Different budget accommodation options include the Super 8 Fort Lauderdale Airport and the Hyatt Place Ft. Lauderdale Airport & Cruise Port. 8 miles (13 kilometers) outside of central Dania Beach, you will find the Acqualina Resort and Spa. The The Setai is positioned 18 miles (28 kilometers) away. Some other hotel options in this area are the The Ritz-Carlton Bal Harbour, Miami as well as the Delano. The greater South Florida region is worth exploring too. If you love nature, get ready to discover South Florida's beaches and everglades. On top of that, spend time at a few of its lighthouses. In this part of United States of America travelers might enjoy hiking and cycling. 18 miles (29 kilometers) to the north of Dania Beach, you can reach Deerfield Beach, which is where you'll find Deerfield Beach Pier and Deerfield Beach Arboretum. Some Travelocity-listed Deerfield Beach hotel establishments include the Doubletree by Hilton Hotel Deerfield Beach - Boca Raton and Hampton Inn Boca Raton/Deerfield Beach. Or, you could stay the night in Weston, 16 miles (27 kilometers) to the west of Dania Beach, where you can choose between the Mizner Place at Weston Town Center and Vacation Village at Weston. Regardless of whether you're passing through or spending a few nights in Weston, a couple of sights worth adding to your itinerary are the Weston Town Center and Sawgrass Recreation Park. 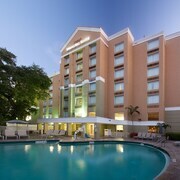 Fort Lauderdale - Hollywood International Airport is located 1 mile (2 kilometers) from Dania Beach's downtown precinct. Modern visitors who would like to find a base nearby can easily secure a room at the Fort Lauderdale Marriott Harbor Beach Resort & Spa or the Lago Mar Beach Resort & Club. Immaculate, spacious, noise proof and fresh looking. Great night sleep! Good service but the hotel was not as close to the beach as I expected. Clean and very friendly/helpful Their recommendation of Paolo’s Ristorante Italiane was awesome!!!! The location was excellent , I would stay there again. The gentlemen who checked me in was excellent and I was a late checked in. The outside of the building and parking was very cleaned . But location was key! One thing I really enjoyed about staying @ this hotel was that when I called the day prior to our stay, because it would be a late arrival (we were flying from Arkansas to FL) they offered to send a free shuttle from the hotel to pick us up at the airport! This had been really nice, since we didn't arrive until after 10:00 p.m., were tired from having flown most of the day to arrive there, and we would be boarding a cruise line early the next morning... They also had their shuttle take us to the port to board our ship - again, at no charge! Another service was offered to pick us up after arrival in port 6 days later, for a very nominal charge - $20.00 for 2 people, and the Ft. Lauderdale airport is about a 30 minute drive from the cruise terminal. The room was nice enough, there were plenty of snacks available on the first floor. I would recommend this hotel because they provided several services FOR FREE, which is rare these days, unless you are staying at a 5 star hotel. Very dated rooms. Otherwise, clean and friendly. Great ship port stopover.